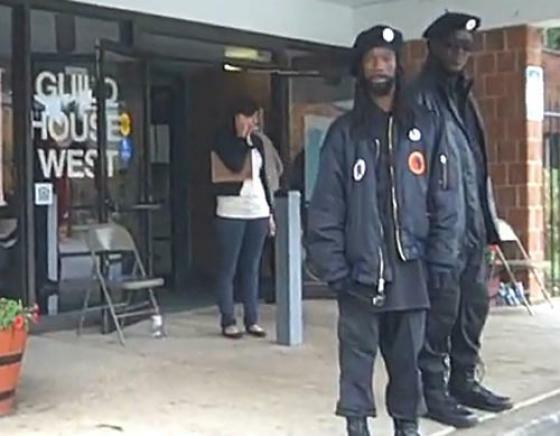 Where are the cries of “voter intimidation” from Leftists? If you think Leftists care about voter suppression or intimidation, then you likely watch fake news. Look at these members of the New Black Panther Party. 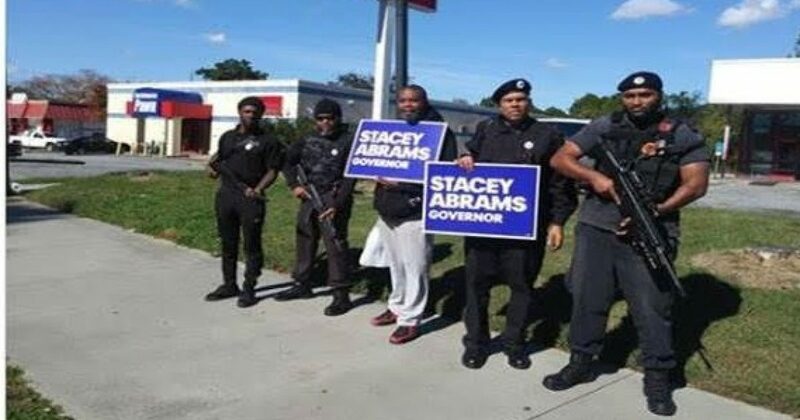 They campaign for GA gubernatorial candidate Stacy Abrams. I don’t know many people who would consider this group to lead their voter registration drive, but then again…I’m not a Democrat. Unlike their predecessor, the New Black Panther Party is a radical hate group who offers nothing to society. Plenty of video evidence exists where NBPP spews its racist hatred, yet the Left are quiet about this. Some ridiculously claim blacks can’t be racist, because we have no power. Imagine for just a moment if the Tea Party sent men with rifles to campaign for a candidate. You can bet the Democrats would claim voter suppression by Republicans, and whine like stuck pigs. 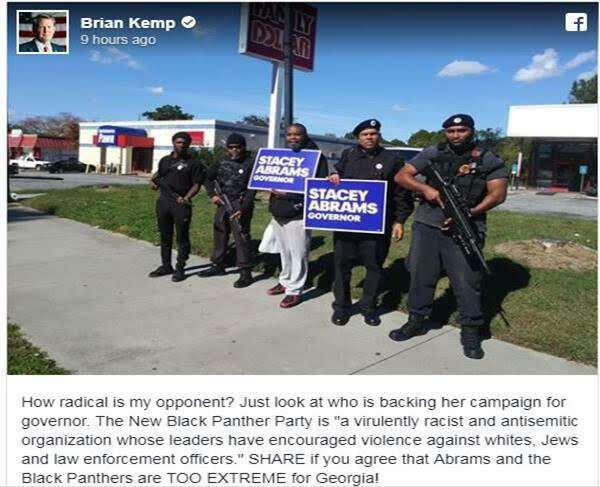 But don’t expect the radical Democrat candidate for Governor, Stacy Abrams to denounce the NBPP as a racist hate group. She won’t disavow them or their antics. Recall the 2008 case of Black Panthers in Philadelphia who stood in doorways with clubs and told whites not to enter to vote. Eric Holder exonerated that group, as part of his “Intimidate Whites” campaign of terror. The group walked around Atlanta, and filmed their march on Facebook live. 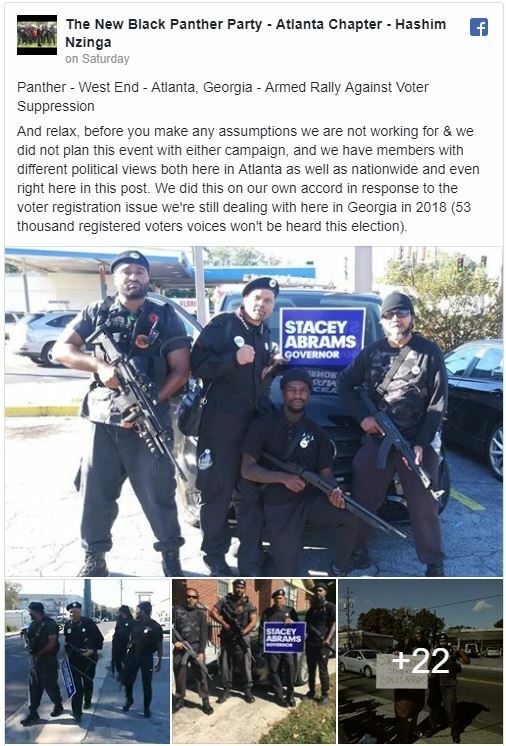 They were supposedly trying to encourage people to head to the polls. By gunpoint is certainly one way to do it. One of the men spoke about wanting to protect their right to keep and bear arms. Interestingly, the Black Panthers originally had a reason to exist. Blacks were being oppressed by white Democrats who routinely targeted blacks for no reason. The group’s beef with the establishment, particularly gun rights is legitimate. Democrats indeed tried to take away the Second Amendment (2A) rights of blacks in this country. Sadly, that effort continues to this day. But their support of 2A rights doesn’t give them a license to openly practice racism. Further, they really need to learn the source of their anger and stop blaming Republicans.